Build your customer list with the clever use one time deals next six months. Do any of these statements sound familiar? Business is not what it used to be. I need new customers. I can’t lower my prices anymore or I will be losing money. How can I get my regulars to dine with me more often? Great tasting food at a good price is all very well but it’s no longer enough to fill your restaurant. Now admit it. I know what you’re thinking. You have this overwhelming urge to offer a discount, a free bottle of wine, a plastic toy for the kids… After all, it’s worked before and everyone else is doing it. But before you jump to giving away the last little bit of margin you have left, ask yourself “Am I getting the most out of this offer?” If you continually discount your prices, what is the customer giving you in return? All too often, restaurants run promotions to get people in the front door. The underlying assumption is that if they come once, the customer will be so impressed with the food and service they will automatically come back again and again. Sadly, nothing could be further from the truth. The vast majority of diners use the discount and never return to your restaurant. The trick is to train them to exchange something they value, the discount, for something you value, such as a change in their behaviour and/or their contact details. When you position your discounts as an exchange of value (i.e. a deal), it makes perfect sense to have qualification criteria. To put this in context, think about how an Early Bird special can help your customer and yourself. All restaurants have peak times. Early Bird promotions get customers to come when you want them to – when you’re not busy. This keeps your peak times free for full paying customers and it is an upfront and transparent way of adding value to both parties. You could stop there, but you can actually get more value out of the deal. You could make joining your Gold Club a requirement of booking the Early Bird special. In other words, this offer is only open to Gold Club members. As part of the club’s terms you ask customers to agree to receive further marketing from you. All you need is their name, address, email and permission. This may sound simple, but it’s really important. After all, you can’t to market your customers if you don’t know who they are. Discounts kill your margins. 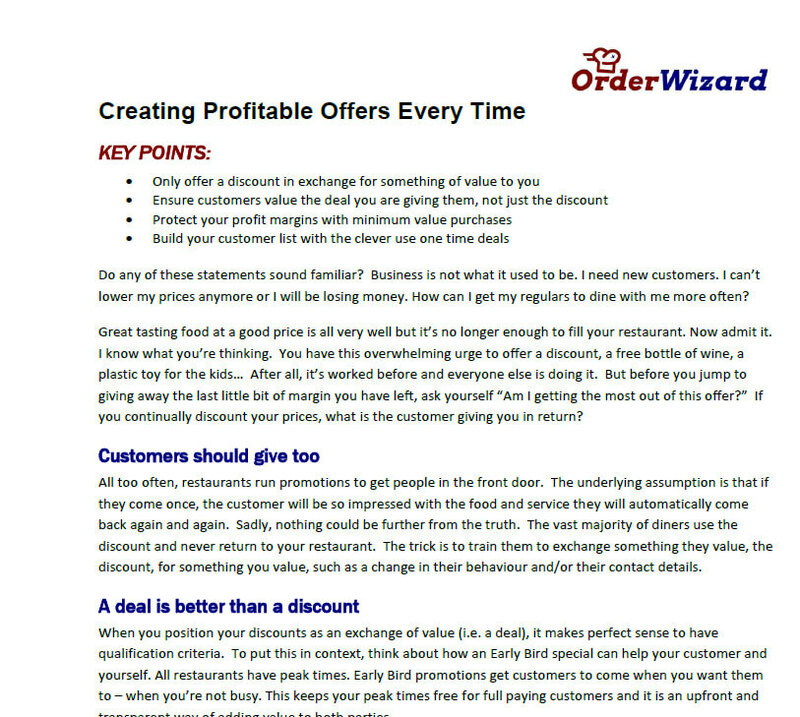 If you have margins of 20% then a 10% discount removes half of your profit. But you can get your profit back again by setting a minimum order value as a requirement of getting the deal. Set the minimum order value for your deal at your average value plus 25% – customers will target that amount and spend a bit more than is necessary to go over the threshold. You may not get as many people taking up the deal, but those who do will be profitable to you. As a result, it’s a win-win: they are happy to get a deal and you’re happy to get a bigger purchase whilst maintaining your profit on the order.